Swiss Franc Surges to Record High: Where was the SNB? One of the clear victors of the Greek sovereign debt crisis has been the Swiss Franc, which has risen 5% against the Euro over the last quarter en route to a record high. 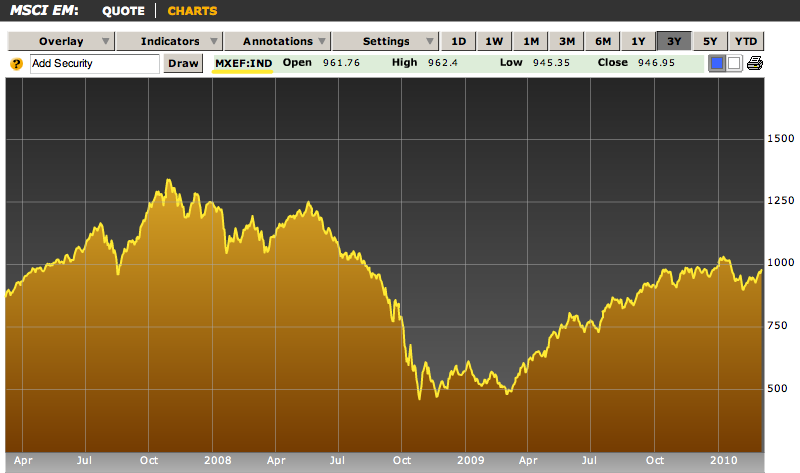 5% may not sound like much until you consider that the Franc had hovered around the €1.50 for most of 2009. Every time it budged from that mark, the Swiss National Bank (SNB) moved swiftly to return the Franc to its “resting spot.” So where was the SNB this time around? Beginning last March, the SNB was an active player in forex markets: “Quarterly figures indicate the central bank spent some 4 billion euros worth of francs in March, 12 billion in the second quarter, some 700 million euros in the third quarter, and some 4 billion in the fourth.” In fact, the SNB might still be intervening, and it won’t be until 2010 Q1 data is released that we will be able to say for sure. The Franc’s rise has certainly been steep, but who’s to stay that it couldn’t have been even steeper. For comparative purposes, consider that the US Dollar has risen more than 10% against the Euro over this same time period. Actually, I don’t think these two statements are necessarily contradictory. The Franc is rising against the Euro for reasons that have less to do with the Franc and more to do with the Euro. 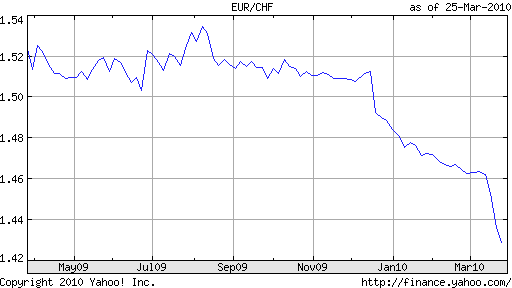 At this point, if the SNB continued to stick to its line in the sand, it would look almost illogical, especially since by some measures, the Swiss Franc is already the world’s most manipulated currency. Besides, by all accounts, the interventionist policy has been a smashing success. The forex markets were cowed into submission for almost a year, which prevented the Swiss economy from contracting more and probably paved the way for recovery. 2009 GDP growth is estimated at -1.5% with 2010 growth projected at 1.5%. Going forward then, it seems the Franc will continue to appreciate. “I think the marketwill cautiously continue to sell the euro against the Swiss franc and perhaps see whether the SNB will step in and try and stop the Swiss franc strength,” said one analyst. As long as the Swiss economy continues to expand and deflation remains at bay, there is little reason for the SNB to continue. 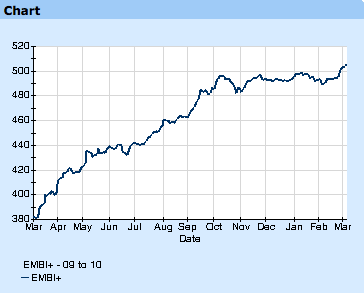 Besides, intervention is not cheap, as the SNB’s forex reserves grew by more than 100% in 2009. On the other hand, the SNB has probably intervened in forex markets on 100 separate occasions over the last two decades, which means that it won’t be shy about stepping back in if need be. A Break-Up of the Euro? Lest you accuse me of doomsday predictions and excessive fear-mongering, consider that I have only broached this topic on one previous occasion. In 2005, it was suggested that the Euro would dissolve since a handful of member countries (France and the Netherlands) rejected the new EU Treaty. [Alas, the tragedy was averted when both countries’ Parliaments ratified the Treaty against the wishes of their respective electorates]. This time around, however, the problems are deeper, and are economic rather than political. Last week [EU Debt Crisis: Perception is Reality], I wrote that Greece only has three possible choices in dealing with its fiscal problems: clean up its finances, pray for a bailout, or (partially) default on its debt. Here I overlooked a fourth possibility: leaving the Euro and devaluing its debt. That this was originally omitted was not an oversight, but proof that this is considered a last resort of last resorts. Most analysts believe that Greece would sooner default on its debt than leave the Euro. I’m inclined to agree. The Greek economy benefited from inclusion in the Euro zone in the form of lower interest rates and increased credibility. Sure, it took advantage of these perks by running up record budget deficits, but one can hardly blame the Euro since Greece binged voluntarily. The responsible move might be for the EU to kick Greece out, akin to the bartender cutting off the alcoholic; you wouldn’t expect the alcoholic to voluntarily stop drinking. For now, Greece is saying and doing all of the right things to placate both EU officials and its own lenders. On the other hand, it faces increasing pressure from its populace. Fiscal austerity during an economic recession is a recipe for political disaster: “Greek workers disrupted transportation services and tried to storm parliament on March 5 as lawmakers passed 4.8 billion euros ($6.6 billion) of extra deficit reductions, including lower wages for public employees. Such cutbacks will continue to run into resistance as unemployment is propelled above December’s 10.2 percent.” Since both of these extremes (fiscal crisis on the one hand and civil unrest on the other) are equally untenable, some analysts think the only solution will be for Greece to leave the Euro. Given that Greece’s economy only accounts for 2% of EU GDP, it won’t make too many waves regardless of what happens. The bigger problem, looming on the horizon, is Spain. Spain accounts for close to 15% of EU GDP, and the economic slowdown hit the nation hard. Low interest rates fomented a massive property and infrastructure boom, and the subsequent easing of monetary policy (to soften the collapse), succeeded only in stoking inflation. The concerns are twofold: that the economic crisis can’t resolve itself without deflation, and/or that economic crisis will trigger a fiscal crisis. While Spain is still far from fiscal crisis, it’s worth pointing out that fiscal austerity will be difficult (because of the economic downturn) and that an EU bailout would impossible because of its size. The situations in Spain and Greece (Ireland and Portugal could also be included) have underscored concerns harbored by many economists since the creation of the Euro. They argue, namely, that the common currency has allowed poor countries to borrow more than they otherwise would have been able to, and that the common monetary policy has resulted in harmful gaps between countries in inflation and economic growth. “They have a single monetary policy and yet every country can set its own fiscal and tax policy. There’s too much incentive for countries to run up big deficits as there’s no feedback until a crisis,” summarized Harvard economist Martin Feldstein. Given that the crisis countries (Greece, Spain, etc.) will probably fight the hardest for the Euro’s preservation, Trichet is probably right. “Support for monetary union was highest in Spain, ‘much higher than in Germany, where a lot of people were reluctant because they already had a strong currency…So Spain is very pro-European.’ As a result, the chances of Spain pulling out of the euro are ‘just unthinkable.’ ” Still, even the outside possibility is enough to make investors nervous. Over the last couple weeks, rising expectations of a resumed appreciation of the Chinese Yuan (RMB) have brought heightened tension. Politicians, economists, and even newspaper columnists are finding themselves involved in increasingly bitter disputes over the issue. What’s more, the debate has regressed; whereas before it was a foregone conclusion that China would soon lift the peg and the only question was when, now people are once again asking themselves whether an RMB revaluation is even necessary/desirable. Breaking with his old strategy (on multiple fronts, it should be noted) of soft speech and appeasement, President Obama is now openly calling on China to allow the RMB to appreciate: “Countries with external deficits need to save and export more. Countries with external surpluses need to boost consumption and domestic demand. As I’ve said before, China moving to a more market-oriented exchange rate would make an essential contribution to that global rebalancing effort.” While this would seem like a fairly mundane exhortation, it marks a strong break from Obama’s previous rhetorical approach, in which he generally avoided singling out China. Meanwhile, the US Treasury Department is busy preparing its semi-annual report on foreign currencies, which will be presented to the US Congress on April 15. As usual, the media is focused on the portion concerning China, specifically with whether it is officially labelled a currency manipulator. Almost by definition, China manipulates the Yuan, but the Treasury Department has heretofore avoided the label because it would allow Congress to impose punitive trade sanctions. Ironically, the most pressure to bestow such a label is coming from Congress, itself. Aside from the report, Congress is not sitting by idly, as evidenced by a recent letter to the President signed by 130 Representatives calling for action. The Senate is also busy with draft legislation that would place a 25-40% tariff on all imports from China unless the RMB is revalued by a similar percentage. “The senators said the U.S. recession could boost the political prospects for the legislation, which [Charles] Schumer has proposed in various forms since 2003. Schumer said the Senate proposal will be attached ‘very soon’ as an amendment to ‘must-pass legislation. The only way we will change them is by forcing them to change.’ ” Perhaps the economic recession has put things in perspective, and the legislation finally has the impetus needed to pass. Chinese government officials continue to send conflicting signals. No less than China’s premier (the #2 man behind only the Prime Minister) Wen JiaBao, told reporters with a straight face that China doesn’t manipulate the Yuan and that in fact, it is other countries which are guilty of such a crime. Added another high-ranking official, “We don’t agree with politicising the renminbi [yuan] exchange rate issue.” On the other hand, Zhou XiaoChuan, head of the Central Bank of China “broke new ground by stating that exiting the stimulus would sooner or later spell the end of the ‘special yuan policy’ adopted to counter the financial crisis.” Evidently, the currency peg is interfering with the ability to conduct monetary policy, specifically by raising rates to fight inflation. As if the position of the government wasn’t muddled enough, the Ministry of Commerce is now running “stress-tests” on large exporters to see how they would fare in the event of a large revaluation. Economists are also getting into the fray, with Nobel Laureate and NY Times columnist Paul Krugman editorializing that China’s Yuan policy “seriously damages the rest of the world. Most of the world’s large economies are stuck in a liquidity trap — deeply depressed, but unable to generate a recovery by cutting interest rates because the relevant rates are already near zero. China, by engineering an unwarranted trade surplus, is in effect imposing an anti-stimulus on these economies, which they can’t offset.” Morgan Stanley’s Chief Asia economist, Stephen Roach, reacted to this accusation by suggesting inexplicably that, “We should take out the baseball bat on Paul Krugman.” This set off a heated back-and-forth (conducted indirectly through other reporters) between the two economists, ultimately accomplishing nothing other than to bring added attention to the issue of the Yuan. At this point, everyone – except for Stephen Roach and the WSJ editorial board – seems to agree that a revaluation would benefit everyone. “I basically think that making the yuan flexible would be positive, not only for the world’s economy, but also for China’s. Many of China’s neighbors seem to have questions about the dollar peg,” summarized a vice Finance Minister of Japan. Chinese officials accept and even share that view, and from their point of view, the revaluation is only a matter of being able to do so on their own terms. As with many things in China (coming from someone who lives there), it’s important to save face. Why is the Loonie Beating the Aussie? It sounds like the beginning to a bad joke, right? But seriously, why is the Canadian Dollar (aka Loonie) beating the Australian Dollar (AUD) when the two currencies are placed head-to-head? The currency markets tend to be very Dollar-Centric, in that they tend to view most currencies relative to the US Dollar (and to a lesser extent, the Euro), rather than to each other. When it comes to the Aussie and Loonie, then, traders at the moment seem content to see them as relatively strong, since both are appreciating against the Dollar. After all, the AUD/CAD pair accounts for only a small fraction of overall trading activity, which means that liquidity is lower and spreads are higher. Why bother? But this ignores the fact that an important battle is currently being waged by the two currencies not only against the Dollar, but also against the other. 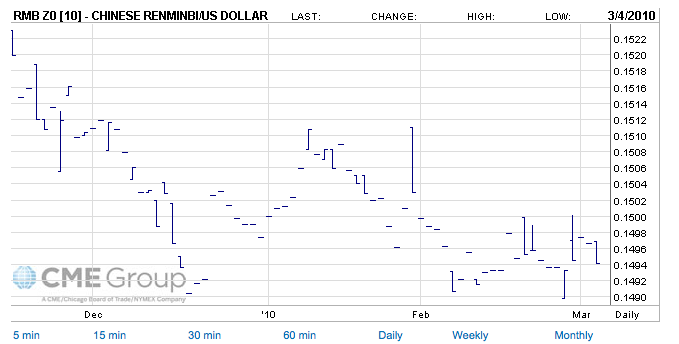 It’s not as if the AUD/CAD rate is determined solely based on triangular arbitrage (i.e. indirectly from the AUD/USD and USD/CAD). On the contrary, there are unique factors which determine this exchange rate irrespective of others, as well as specific financial instruments. But enough with the palavering!Let’s try to understand the idea of parity as it exists between the Loonie and Aussie, and not relative to the Greenback. I like to begin any analysis by looking at a chart. But as with any financial chart, a different time period changes the whole picture. In this case, the 1-year chart shows the Australian Dollar gaining in 2009 (in fact it was the highest performer last year among all of the majors) from the lows of the credit crunch, but retreating in 2010 away from parity. It is this latter trend that I want to elucidate here. On paper, the Aussie would seem to be the clear favorite. As a result of this month’s interest rate hike by the RBA, the benchmark Australian rate (4%) is now a healthy 3.5% higher than its Canadian counterpart (.5%). This should favor the Aussie among carry traders looking for the highest yield differentials. In addition, the Australian Dollar accounts for a higher portion (6.7% versus 4.2%) of forex turnover than the Canadian Dollar, according to the most recent data, which means that the AUD wins the liquidity battle as well. Meanwhile, Australia’s public debt is near the low end among developed countries, at almost 15% of GDP. After a record 2009 budget deficit, Canada’s public debt is close to 80% of GDP and is among the highest the world. Finally, Australia’s economy was one of the first to emerge from recession (some say it never even officially entered recession), certainly before Canada. But all of this is in the past. “Canada is on course to be the first Group of Seven nation to erase its budget gap after the global financial crisis.” [Australia should have won this distinction, but alas, it’s not a member of the G7]. 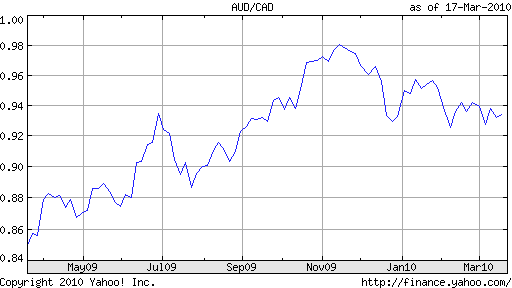 In 2009 Q4 (the most recent for which data is available), Canada’s economy grew at 5%, compared to 2.7% in Australia. While the US economy – Canada’s largest trade partner – is accelerating, China – Australia’s most important trade partner – is attempting to slow down. While both the Aussie and Loonie are thought of as commodity currencies, the Loonie is currently benefiting from higher oil prices while the Aussie could suffer from peaking coal and iron ore prices. 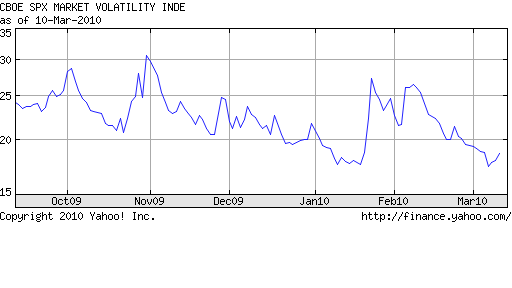 Volatility (as implied by options contracts) is lower for the Loonie, and this is just as significant as the interest rate differential, when it comes to the carry trade. When you consider finally that “Canada’s financial system was named the soundest in the world for two consecutive years by the Geneva-based World Economic Forum,” its banks are all financially sound, and the attention garnered by the Vancouver Olympics, it’s no wonder that the Loonie is now edging ahead. Over the last five years, the two currencies have been pretty stable against each other. [Against a basket of other currencies, the Loonie is ahead, with a 20% total appreciation compared to the Aussie’s 17% rise]. Thus, the current ebb could be a necessary correction. While analysts like to see things in terms of important psychological milestones, there’s no real reason why the two currencies should trade at 1:1 (parity), and the equilibrium value could very well be below the current level. This is evidently how the markets feel, as the Aussie just slipped below its 200-day moving average against the Loonie for the first time since 2008. In addition, “Investors paid the largest premium in almost a year last month for Australian dollar put options versus the Loonie. The premium of contracts granting the right to sell the Aussie versus the Canadian currency in one week over those for buying increased on February 8 to 1.18 percentage points, the biggest since April 2009.” After all, the Aussie’s appreciation in 2009 was the highest in 15 years. Perhaps it’s only natural that all else being equal, it should fall a bit in 2010. I wonder if I wasn’t a little glib in my last post （Dollar Returns to Favor as World’s Reserve Currency）when I implied that the Euro would necessarily continue falling because of ongoing sovereign risk crises. In actuality, the situation is much more nuanced, and I want to qualify this idea below. As I’ve said before, the sudden sovereign debt crisis in Greece is one of many. While its fiscal problems are certainly serious, they are not markedly worse than those of other countries, and it’s somewhat hard to understand why the markets suddenly decided to gang up on Greece. As many analysts have been quick to point out, Portugal, Ireland and Spain are in equally bad shape. Perhaps, it is the unique combination of factors which has led investors to focus on Greece in particular: “Greece stands out for the size of its debt stock, the scale of its budget deficit and the grimness of its growth prospects given high domestic costs and an inability to devalue.” But again, this inability to devalue its debt is shared by every other member of the EU. By virtue of belonging to the Euro, all of these countries must face their debt problems as they are, and cannot attempt to alleviate them through currency depreciation. It is for this reason that I think that the EU will continue to be the main loser from real (and perceived) debt crises. As you can see from the table below, of the ten countries whose debt positions are least sustainable, seven of them are current members of the EU. This is problematic for the Euro, because as far as currency markets are concerned, one country’s problem is automatically a pan-EU problem. If you look again at the Greek debt crisis specifically, there are really only three possible outcomes: “one of the most excruciating fiscal squeezes in modern European history – reducing the deficit from 13 per cent to 3 per cent of gross domestic product within just three years; outright default on all or part of the Greek government’s debt; or (most likely, as signalled by German officials on Wednesday) some kind of bail-out led by Berlin.” While such a bailout would temporarily stabilize the crisis, it would set a dangerous precedent in terms of dealing with fiscal crises in other EU countries and would do nothing to solve Greece’s underlying structural problems. Only under the first outcome, then, would the Euro not suffer, and unfortunately this one seems least likely. Of course, the ultimate resolution of the crisis is still many years away. For now, currency traders are perhaps less interested in whether Greece will get its fiscal house in order and/or receive an EU bailout, and more concerned with how perceptions of the crisis will evolve. Recently, many investors have been taking their cues from the market for credit default swaps (CDS), which functions as insurance against and can be used to gauge the likelihood of sovereign default. In the case of Greece, CDS premiums have been rising (now implying a 4%+ chance of default), even though demand for Greek bond issuances remain strong at moderate interest rates. This discrepancy can best be explained by the presence of speculators, which are also working to push the Euro down. Interestingly, the EU is currently mulling a ban on speculative (naked) CDS purchases, which would theoretically lead to lower CDS premiums and in turn, assuage other investors that the likelihood of a Greek default is low. On the face of things, this would probably – investment and lending in the EU, as sovereign risk would be less of an issue. However, there is still the possibility that speculators would continue to push down the Euro, for lack of a better strategy. In fact, they could even redouble their short bets against the Euro, since the CDS ban would deprive them of a valuable strategy for betting directly against Greece. (In fact, CDS speculation, while leading to higher interest rates and making it more difficult for Greece to finance its deficit, actually has no direct effect on the Euro, since it doesn’t necessitate a cross-border transaction). Alas, then, it’s actually hard to predict (as always!) 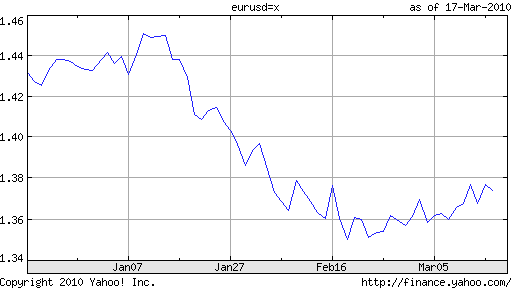 the near-term direction of the Euro. Since the crisis is still more perceived than actual, it’s clear that the Euro decline is a product of speculation and uncertainty, neither of which will disappear anytime soon. The best hope, then, for the Euro is probably just that investors will simply get bored with the story – as they eventually always do – and turn their attention to something else. 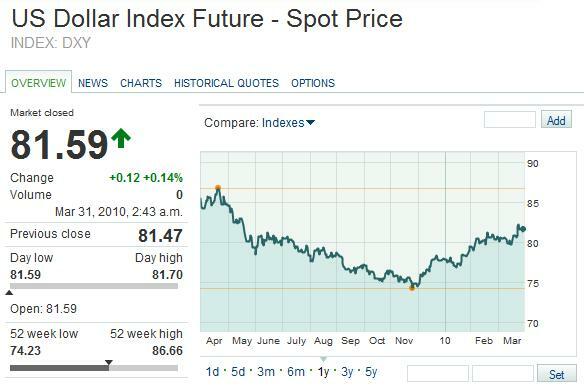 Rumor has it that the Dollar is about to make a run. As the credit crisis slowly subsides, (currency) investors are once again looking at the long-term, and they like what they see when it comes to the Dollar. For those that care to remember, 2008 was a great year for the Dollar, as the credit crisis precipitated an increase in risk aversion, and investors realized that despite its pitfalls, the Dollar was (and still is) the most stable and really the only viable global reserve currency. [This reversed a trend which had essentially been in place since the inception of the Euro in 1999]. In 2009, meanwhile, the Dollar resumed its multi-year decline, and many analysts were quick to label the rally of 2008 as an aberration. Then came the debt crises, first in Dubai, then in Greece. Suddenly, a handful of smaller EU countries appeared vulnerable to fiscal crises. Japan officially became the first of the Aaa economies to receive a downgrade in its credit rating. The British Pound is dealing with crises on both the political and economic fronts. According to Moody’s, “The ratings of the Aaa governments — which also include Britain, France, Spain and the Nordic countries — are currently ‘stable’…But…their ‘distance-to-downgrade’ has in all cases substantially diminished.” Suddenly, the Greenback doesn’t look so bad. I want to point out that in forex, everything is relative. (Novice) forex investors are often baffled by how sustained economic and financial crises don’t immediately result in currency depreciation. The explanation is that when the crises are worse in (every) other countries, the base currency still looks attractive. This is precisely the case when it comes to the US Dollar. To be sure, the economy is still flawed, financial markets have yet to fully to recover, the federal budget deficit topped $1.8 Trillion in 2009, and government finances seem close to the breaking point. Moody’s has also identified the US as a candidate for a ratings downgrade. And yet, when you look at the situation in every other currency that currently rivals the US for reserve currency status, the Dollar still wins hands down. Australia Hikes Rates; How about the Carry Trade? Following up on my last post, I want to use this post to write about the long side of the carry trade- specifically the Australian Dollar. The Bank of International Settlements (BIS) observed in a recent report that, “The role of short-term interest rate differentials in both the deprecations and their reversal has grown over time.” When you consider that the benchmark interest rate in Australia is now 4% and that interest rates in every other industrialized country (including Japan) are close to 0%, it’s not hard to connect the dots. Earlier this month, the Reserve Bank of Australia (RBA) raised the benchmark by .25% for the fourth time since it began tightening. In an accompanying press release, the RBA stated that “The board judges that with growth likely to be close to trend and inflation close to target over the coming year, it is appropriate for interest rates to be closer to average. Today’s decision is a further step in that process. 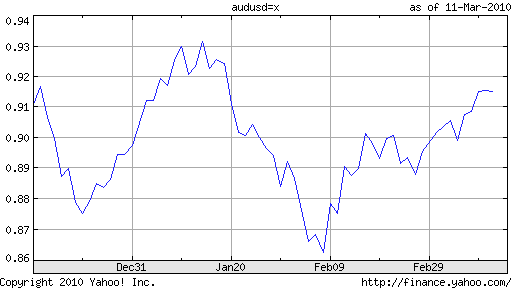 It’s worth noting that the Australian Dollar barely budged, because investors had expected the move. The larger question was, and still is, the ultimate extent of RBA rate hikes and how soon it will get there. Glen Stevens, Governor of the RBA, has himself indicated that “rates are still 50 to 100 basis points, or hundredths of a percentage point, below normal.” If you do that math, that means that the RBA will hike rates to 4.5-5% before stopping. Other more bullish analysts think 5-6% is a more realistic expectation because it is closer to the long-term average of Australian rate hikes. As to when the benchmark will reach that point, it’s anyone’s guess. Going forward, analysts have pegged the liklihood of an April rate hike at 40%. Said one analyst, “It’s now a line-ball call; indeed, if you put a gun to my head . . . I’d guess that the RBA is going to hike again by 25 basis points in April.” Still, most think that the RBA won’t hike again until May. Added another analyst, “They are not indicating any urgency. We think they will go again in a couple of months. It could be three months, it could be two, our formal view is two, that may depend on how the inflation numbers look.” It’s too early to project when the next next (after the next one) hike will take place, because it depends on the timing of the first one. At this point, most Australian economic data is trending steadily in the right direction. “Australia’s economy is starting a new upswing…Unemployment fell to 5.3% in January, not far above levels considered full employment for the economy…A rebound in construction and an investment splurge in the mining sector are expected to restore growth in the economy back to historic averages by the end of 2010. The RBA has indicated it expects inflation to remain within its 2%-3% target band.” Without drilling too deeply into any of the other numbers, there’s very little reason to doubt that the Australian economic recovery is genuine, which reinforces the notion that it is only a question of when – not if – the RBA further hikes rates. In fact, the Australian Dollar just touched a 13-year high against the Euro – though that is as much due to the Greek debt crisis and Euro problems as it is with Aussie strength. Meanwhile, the Australian Dollar has zig-zagged against the US Dollar, and is now in a rising trend following a recovery in risk sentiment. Whether it sustains this momentum depends largely on whether the RBA hikes rates next month. 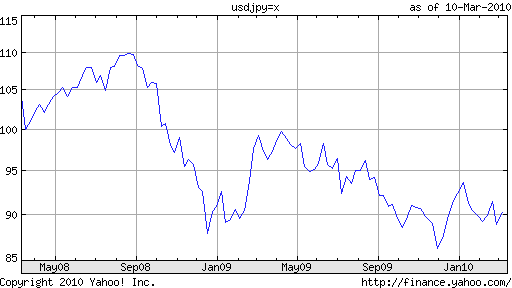 Yen Carry Trade is Back! I can’t remember how long it’s been since I was hyping the Yen carry trade (though a browsing of the ForexBlog archives indicates 2 years). Upon the outset of the credit crisis, forex markets went haywire, and one of the main “beneficiaries” was the Yen, which soared as carry trades were unwound. Now, however, a similar set of circumstances that made the Yen carry trade attractive from 2006-2008 have re-appeared, and it looks like the trade could be on the verge of making a big comeback. Practitioners of the carry trade understand that it has a few pre-conditions. The first is low interest rates. In this case, the benchmark Japanese interest rate is only .1%. While that would have meant something a few years ago, however, it no longer counts for much, since benchmark rates in other industrialized countries are just as low. Where Japan has the edge is in market interest rates. Long-term rates have historically been well below the global average, and short-term rates are finally following suit after a 3-year hiatus. In fact, for the first time since August, the 3-month Japanese LIBOR rate – a lending benchmark – fell below its US counterpart: “On Thursday, the yen Libor JPY3MFSR= was fixed at 0.25063 percent — its lowest level since May 2006 — and the dollar USD3MFSR= rate at 0.25219 percent.” In short, the Japanese Yen is once again the cheapest currency in the world to borrow. In addition, interest rates in Japan will probably remain low for the immediate future, as the Bank of Japan is actually looking to make its monetary policy even more accommodative (I didn’t think this was possible with a benchmark rate of only .1%! ), in order to further stimulate the economy and alleviate the risk of deflation. This contrasts with Central Banks in other countries, which are already contemplating interest rate hikes. The pickup in risk aversion – as a result of the Greek debt crisis – may have delayed the return of the Yen carry trade. In January, volatility rose slightly and the Yen rallied as the safe-haven mentality set in. Personally, I find this somewhat ironic, since Japan’s debt problems are even more pronounced, and unlike Greece, it can’t count on a bailout from Greece if things really get rough. Still, the markets work in strange ways, and the fact that the Yen has benefited from the crisis is probably due to the fact that traders can’t short all currencies simultaneously. I don’t mean to get excited, but it’s hard to state a better case in favor of an imminent return of the Yen carry trade. One of the pitfalls of forex blogging (or all financial reporting for that matter) is that it’s inherently after-the fact. In other words, any information about the past – while relevant – is inherently useless, since it has theoretically already been priced into the asset (or currency in this case). Before I begin my post on the Pound’s recent decline and the factors that wrought it, then, I wanted to offer the caveat that in analyzing past events, we must simultaneously look to the future. Anyway, for anyone watching the Pound Sterling over the last month, its performance has been startling. It is down 7.5% for the year already (we’re only in March! 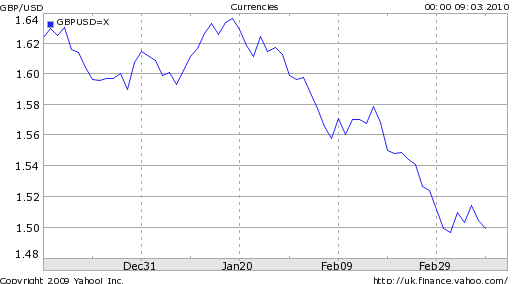 ), and has fallen 12% from its August peak of 1.70 USD/GBP. This represents an unbelievable about-face, as the Pound spent much of 2009 floating upwards following its lows from the credit crisis. What’s behind the decline? In short, economics and politics, or more precisely, the junction of economics and politics. As the British economy began its recovery from recession, analysts began to turn their attention to UK government finances. Another way of looking at this would be to say that analysts have shifted their gaze from the positive effect of government intervention (i.e. economic recovery) to the many lasting negative effects. Inflation and government solvency, of course, are the two most pernicious of the bunch. The Bank of England’s quantitative easing program was comparable to the Fed’s program in relative terms, and in the aftermath of all of that money creation, inflation is slowly creeping up. The government’s free spending also contributed, and now, so is the sinking Pound, as prices for commodities and other imports are rising fast in local currency terms. Speaking of government spending, the UK government budget deficit is projected at 12% for 2010, slightly higher than 2009. You can see from the chart below that budget deficits are forecast to remain large for the next few years. Expectations are so low, in fact, that a reduction in the deficit to 3% of GDP by 2014-2015 would be viewed as a victory. Naturally, the UK government feels some pressure to reduce its deficit, both for the sake of financial solvency and to control inflation. The problem is that an election must be called before June, and until then, there is natural pressure to continue operating the money printing presses 24/7 in order to appease the voting public. The same goes for the Bank of England; it can’t be expected to tighten monetary policy and/or reverse quantitative easing until after the election. I’m not going to pretend that I understand British politics, but from what I’m hearing, it seems the problem is that the election polls are now very close. Previously, a major victory by the Conservative Party was seen as inevitable, and this was viewed positively by financial markets because of the expectation that they would rein in spending. Recently, the incumbent Labour Party has closed the gap, to the extent that a hung Parliament is now a likely outcome. This would be even less desirable than an outright Labour victory, because the sharing of power would make it unlikely that reforms of any kind would be enacted. With regard to forex, some have posited an inverse correlation between the rising popularity of Labour and the falling Pound. With the crisis in Greece still unresolved, analysts are also making comparisons to the UK. Some have suggested that if Greece were to receive a bailout, then, investors would turn their attention to the UK, whose finances are in equally bad shape. Without the protection of the Euro, the Pound would be open to speculative attack. On the other hand, that the (declining) Pound is independent from the Euro could become in advantage, if it boosts exports. Going forward, it’s difficult to make any predictions until after the elections and/or the government makes a firm commitment to reduce spending and lower its deficit. Some analysts think that regardless, the Pound is doomed to continue falling, perhaps all the way to the $1.40 mark. Others see the current decline as the “darkness before the dawn.” As I noted in the introduction to this post, the latter could certainly be right. Besides, most of the uncertainty has probably already priced in. While most of the factors currently weighing on the Pound are bearish, some contrarian investors might see this as a good opportunity to buy. And who’s to say they’re wrong? The Wall Street Journal’s coverage of the Greek dent crisis has focused less on the crisis itself, and more on the markets’ reaction to it. With headlines like “Hedge Funds Try ‘Career Trade’ Against Euro” and “Speculators Bet Record Amount Against Euro For 4th Week” and “Europe Trouble, U.S. Opportunity” – among others – the WSJ has identified a collapse in the Euro (mainly against the Dollar) as one of the most prominent (and profitable!) strategies for exploiting the crisis. As I mentioned in the last post (“Understanding the Greece Situation“), the debt crisis has become self-fulfilling, not only for Greece, but also for the Euro. In other words, as perceptions abound that Greece is insolvent and the Euro is doomed, Greek bonds and the Euro have lost value, which only makes the crisis worse. It seems that speculators are taking advantage of this phenomenon by making large bets against the Euro. In fact, large is an understatement, as the net short positions against the Euro now total a record $12 Billion, according to the closely watched Commitment of Traders report. 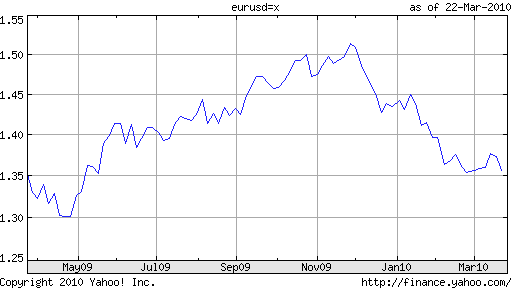 Some analysts have taken such information at face value, noting that “The fact that the shorts got even shorter when they were already at extreme levels highlights just how negative the sentiment is toward euro.” On the other hand, there is evidence (and some degree of admission) that large speculators are now acting in concert to bring down the value of the Euro. The WSJ reports mention private meeting between hedge funds managers and investment banks helping their clients bet against the Euro using derivatives. For those that are skeptical that speculators could really influence currency markets, consider that one man – George Soros – single-handedly forced a devaluation of the Pound in 1992, and made $1 Billion in the process. While the Euro is certainly bigger than the Pound ever was, there are more people watching it than ever, and when there is money to be made – hundreds of billions of dollars in this case – it isn’t inconceivable that the Euro could suffer a similar fate. Already, there is evidence that this strategy is working, as the Euro has fallen 10% in less than three months, which is unbelievable for a currency whose daily trading volume is estimated at $1.2 Trillion. In fact, one popular options trade is based on the the Euro falling to parity against the Dollar. Once unthinkable, such a possibility now faces odds of “only” 1 in 14 (based on options premiums), compared to 1 in 33 in November. On the one hand, it’s frustrating to accept the market power that these speculators have. But emotion has no place in (forex) trading, and standing in the way of momentum would be costly. On the other hand, Euro fundamentals remain strong. To be sure, a currency is only as strong as its constituent parts, and the fact that a handful of EU member states have shaky finances certainly cannot be dismissed. At the same time, the fact that such currencies have no direct control over the Euro is just as important. Before the inception of the Euro, currency traders would be justifiably concerned that a country in a similar position to Greece would deliberately devalue its currency (by printing money) in order to devalue its debt and make it more manageable. Now, this would be impossible, since the Euro is controlled by the European Central Bank, over which Greece has no power. The current crisis in Greece notwithstanding, “The European Central Bank’s (ECB) resolve to maintain sound money is…important. This is especially true for the ECB, which has a single mandate—price stability—unrelated to fiscal problems.” While there is legitimate concern that the ECB will be forced (or voluntarily) print more money to fund bailouts of bankrupt EU member states, this doesn’t seem very likely, given the history of the ECB. Its monetary policy has always been quite conservative, and it’s no wonder that the Euro has come to be seen as a viable alternative to the Dollar. In my opinion, the decline in the Euro is mostly baseless, and if it were to continue, it wouldn’t represent the prevailing of logic. Then again, logic is not exactly a word that I would apply to the forex markets, now or ever.